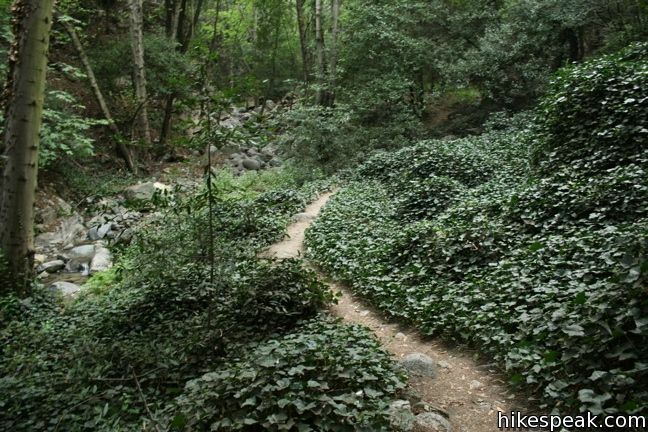 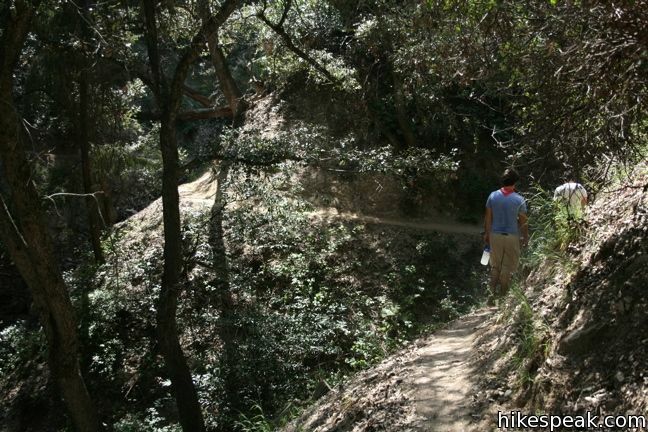 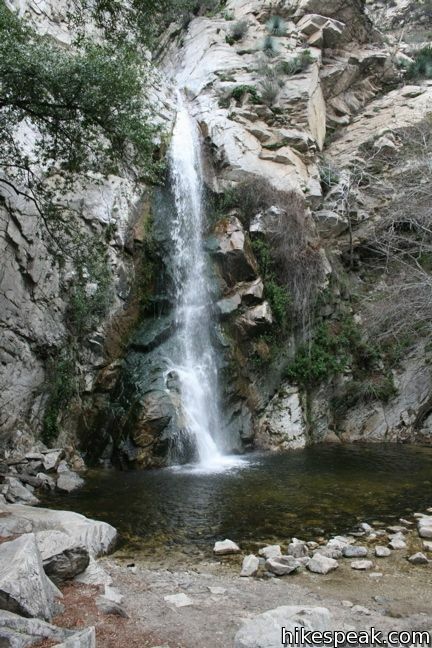 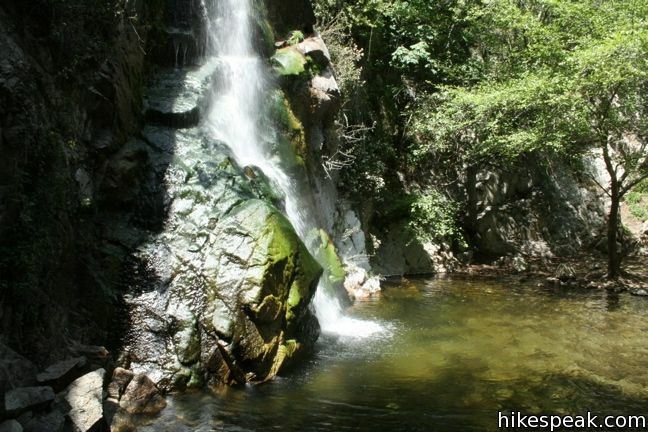 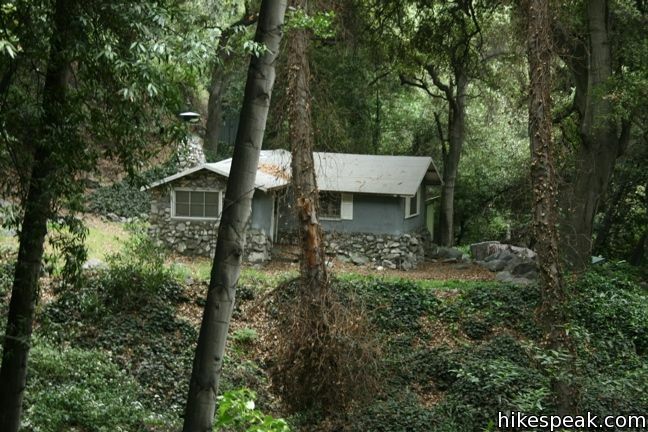 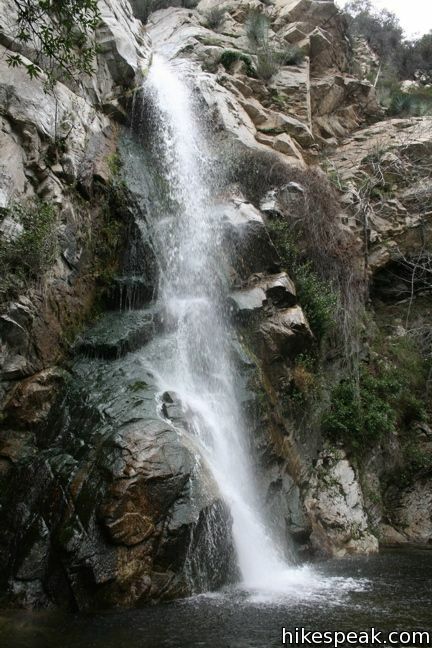 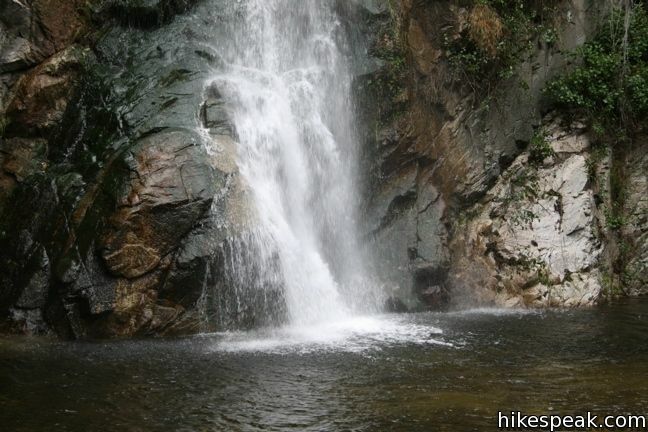 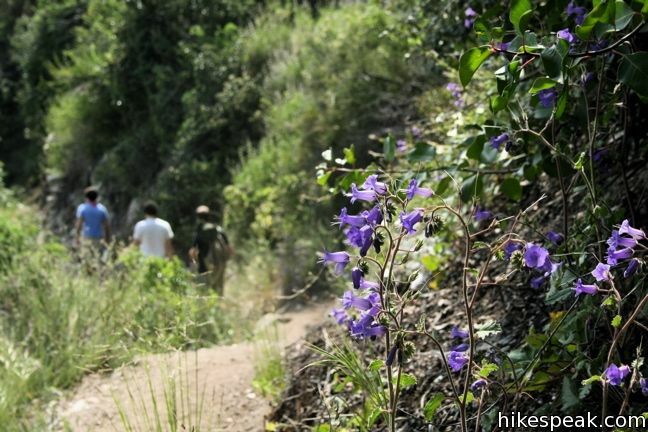 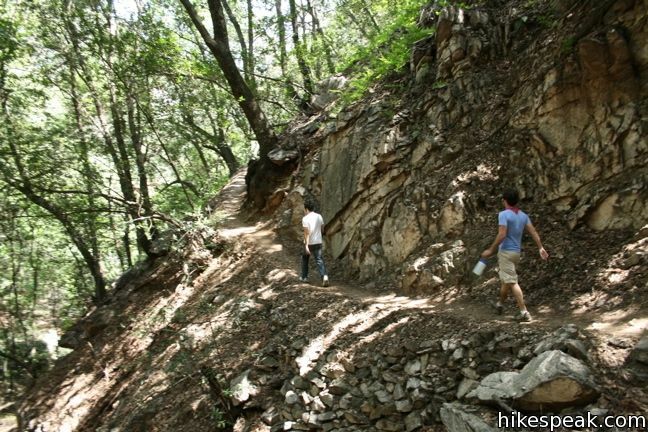 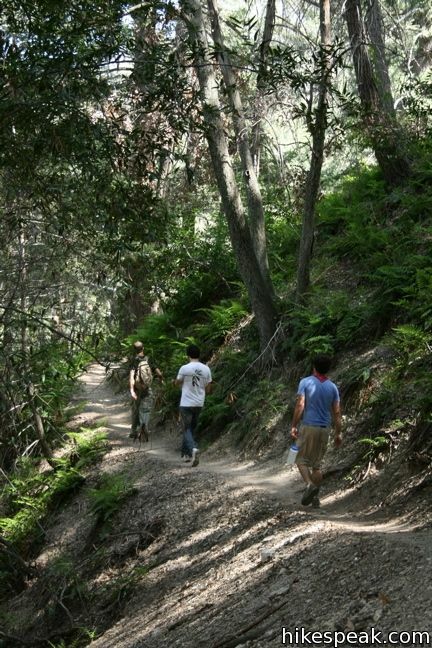 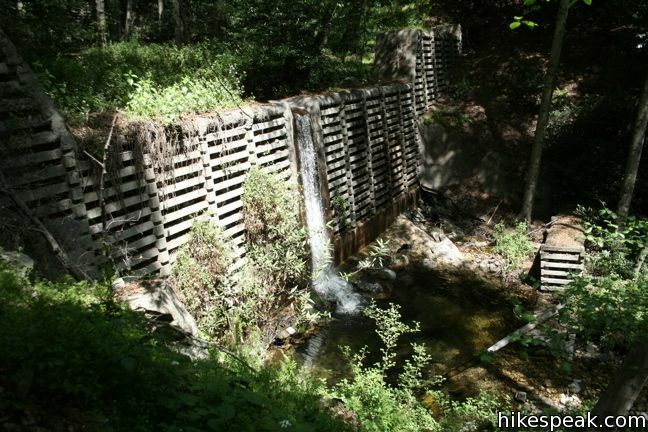 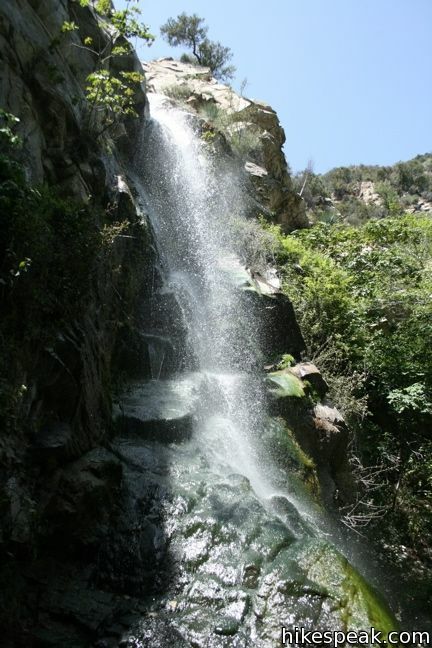 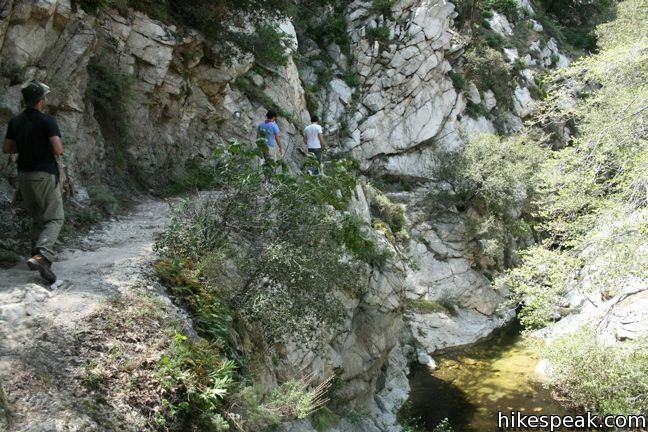 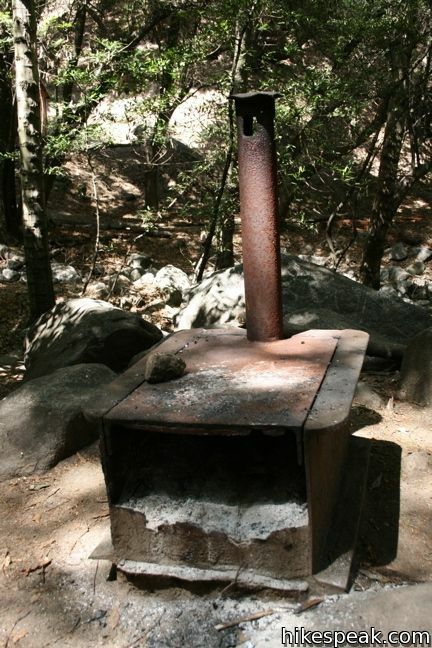 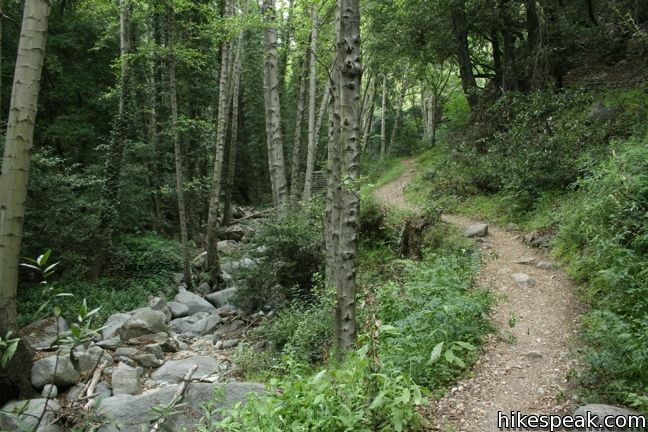 After hiking to Spruce Grove Camp above Sturtevant Falls, why not return to Chantry Flats by crossing over Mount Zion? 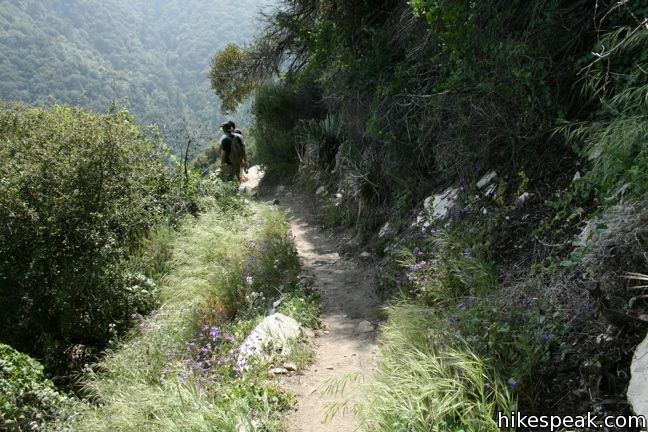 The trail to Mount Zion passes along the east side of a ridge leading up to the summit. 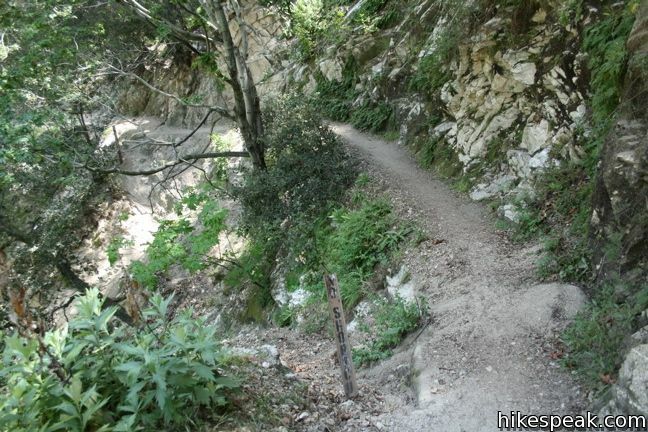 The grade is gentle, and after all the demanding switches beneath Spruce Grove, the trail feels surprisingly kind. 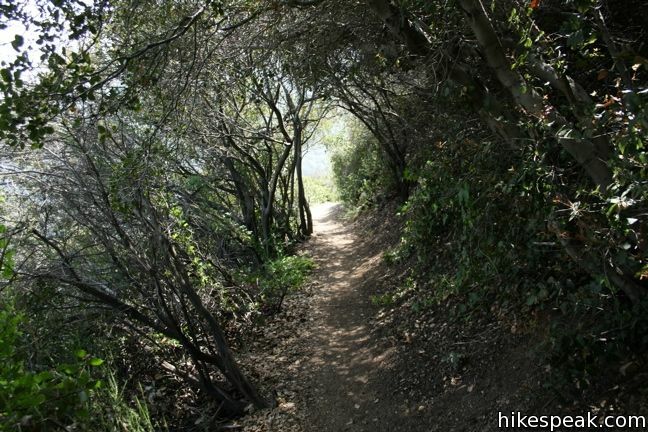 Only 400 feet of elevation separate Spruce Grove Camp and Mount Zion, which is crossed over 1.5 miles on a smooth ascent. 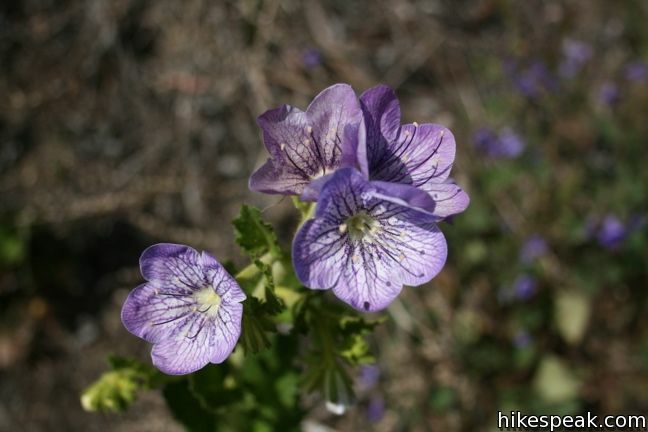 While Upper Zion Trail spares you the tough climb that you would expect to find on a summit hike, the trail still delivers a superb passage through an evergreen forest, capped with a scenic overlook at the top. 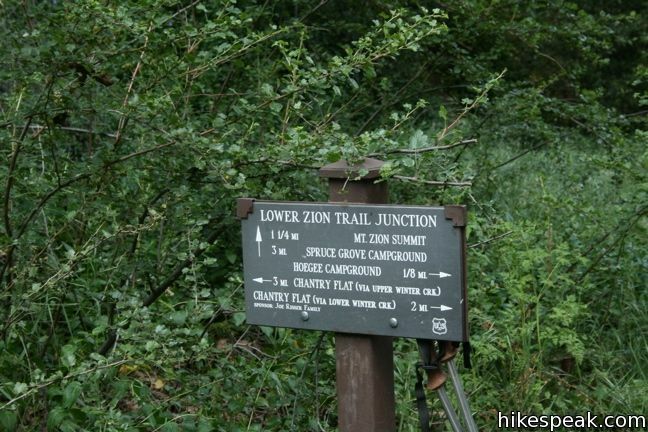 Upper Zion Trail begins with two important junctions. 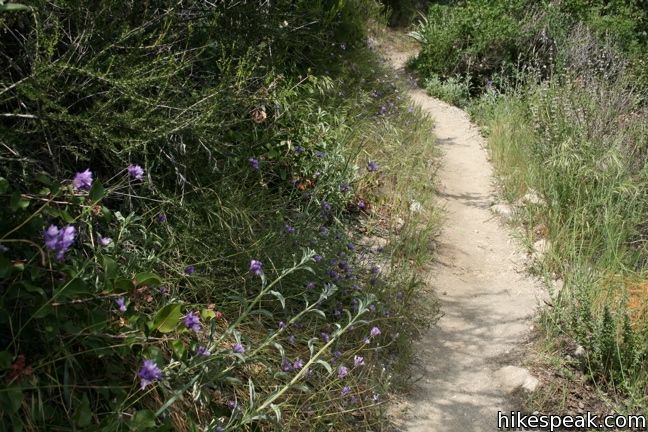 On Gabrielino Trail just above Spruce Grove, come to a small junction beneath Sturtevant Camp. 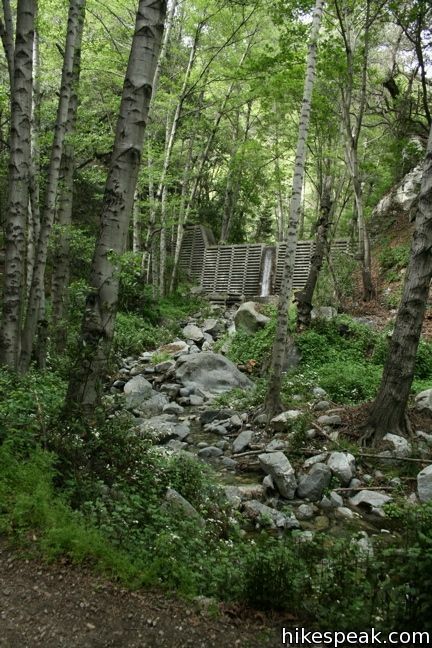 Leave the Gabrielino Trail here and turn left on a hard-to-see path that crosses over an artificial dam. 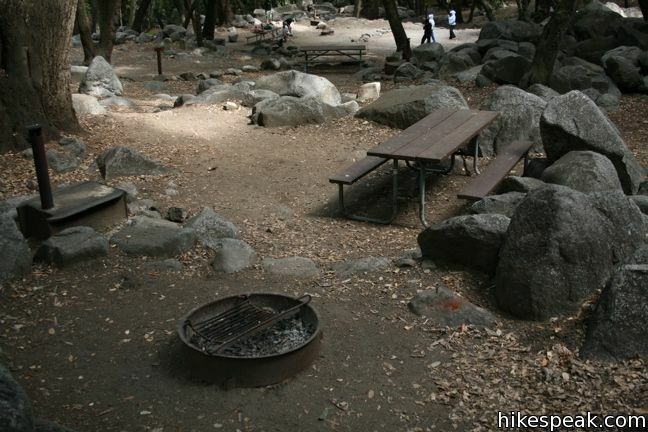 If you reach Sturtevant Camp, you missed the turnoff. 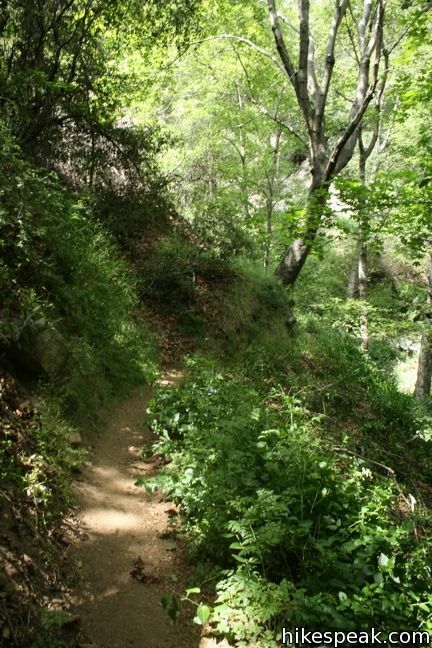 After 1/8 of a mile on the connector trail, make a left onto Upper Zion Trail. 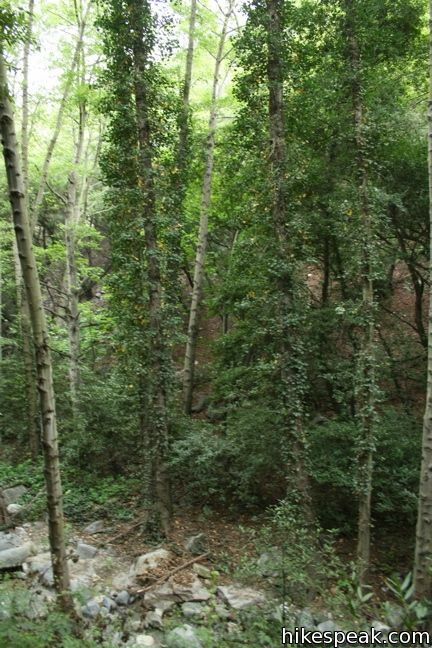 Signs are posted at both junctions. 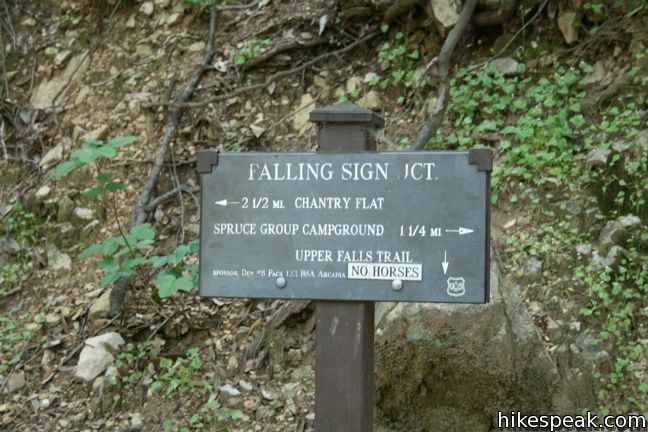 From Spruce Grove Camp, it is 1.5 miles to the summit of Zion. 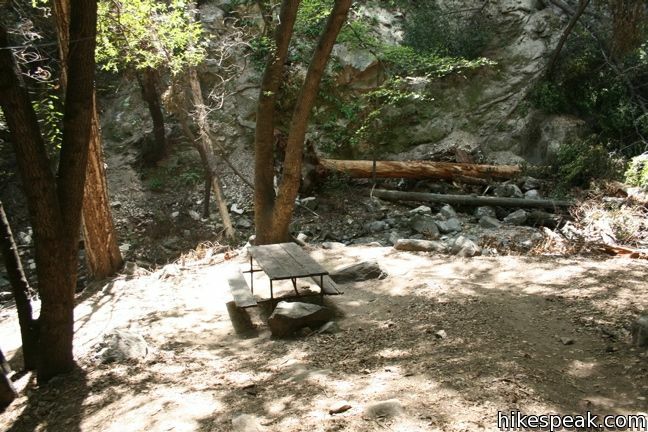 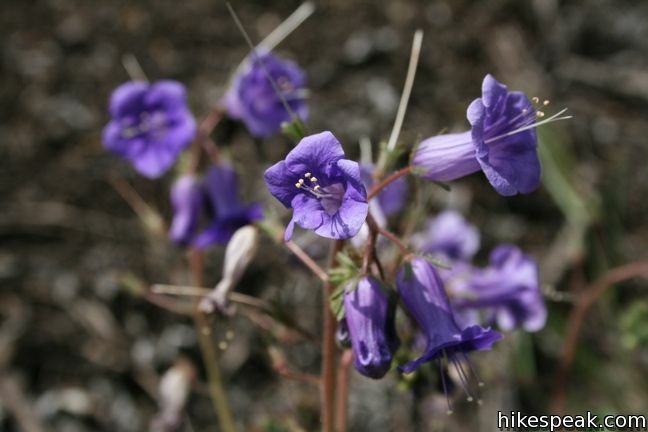 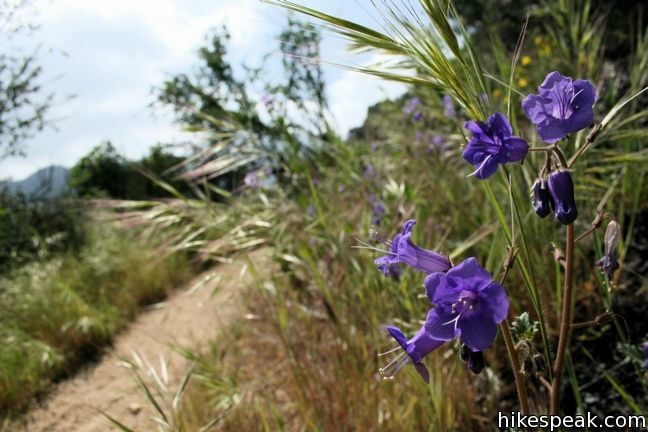 If you are returning to Chantry Flats, (and not camping overnight at Spruce Grove Trail Camp) it will be shorter to descend down Lower Zion Trail to Hoegees Camp and complete the Santa Anita Canyon Loop. 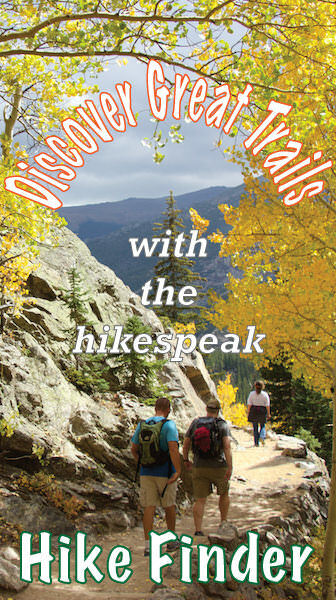 Dogs are welcome on leashes. 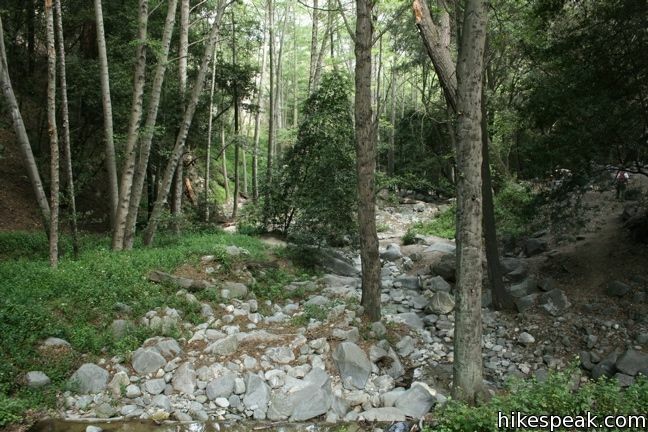 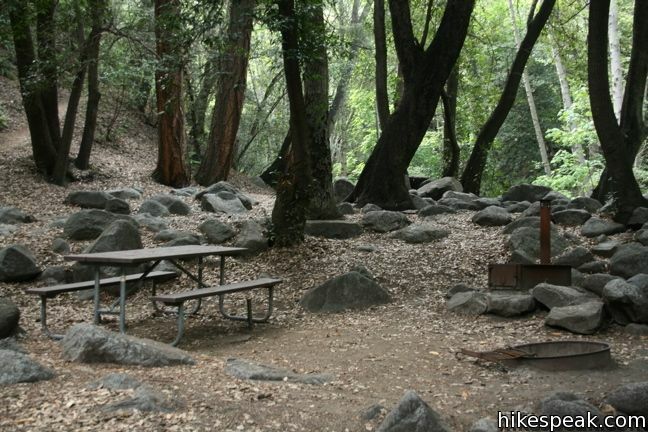 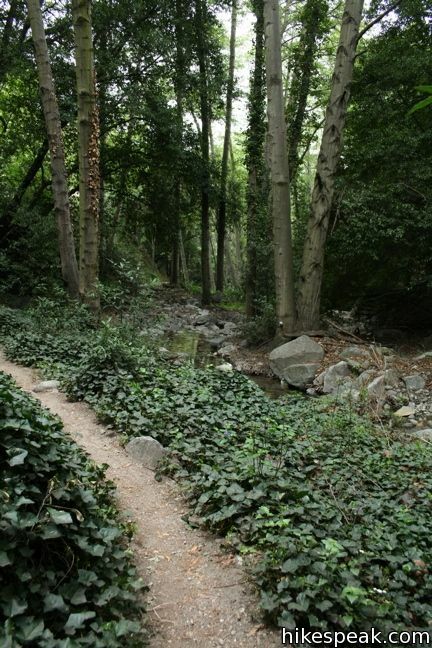 A National Forest Adventure Pass is required for vehicles park at the Chantry Flats Trailhead. 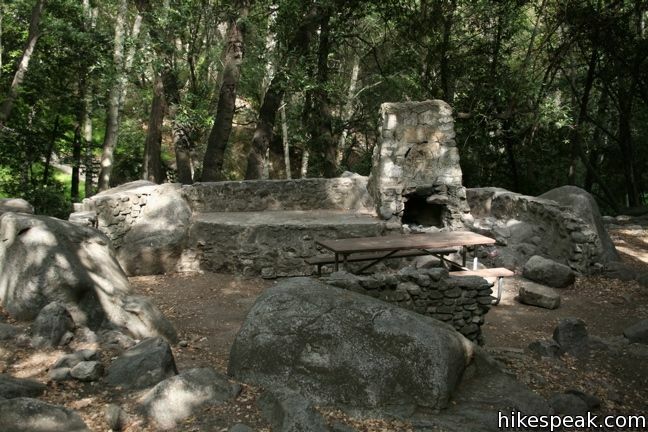 No permit is needed to hike to Mount Zion, so get out and enjoy! 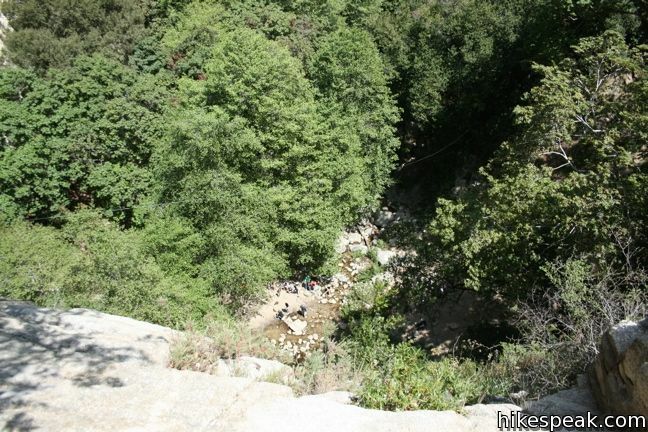 These photos were taken in April of 2009. 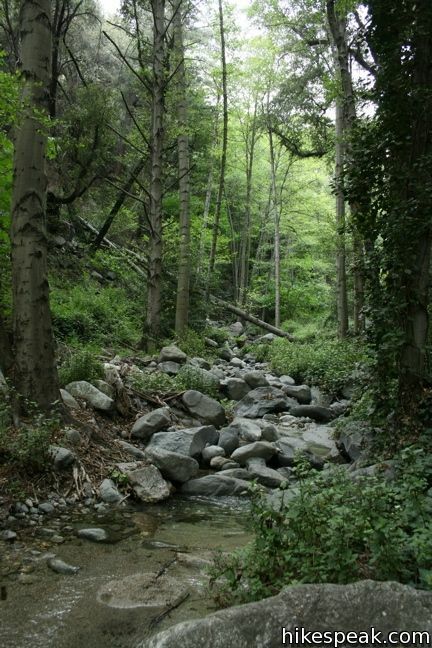 Click to enlarge. 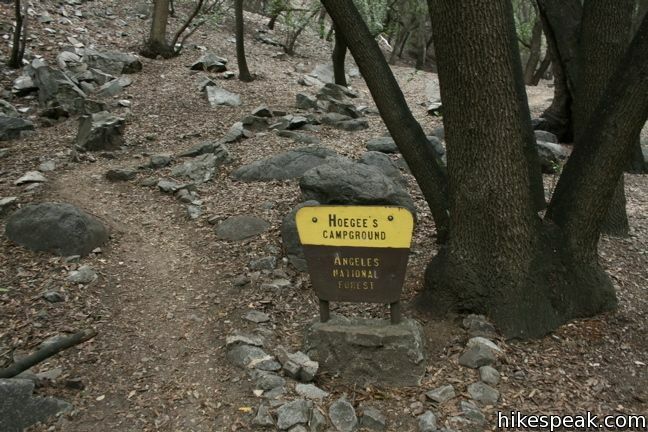 The trail from Hoegees Camp up Mount Zion is 1.5 miles long. 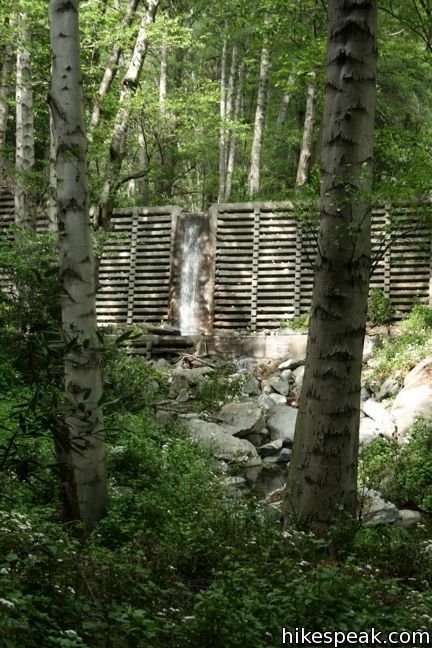 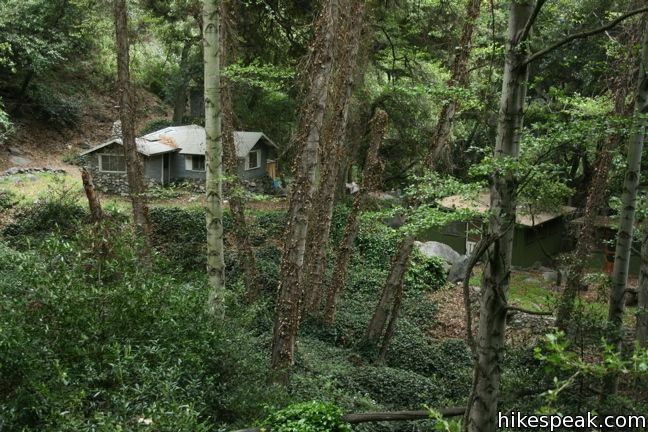 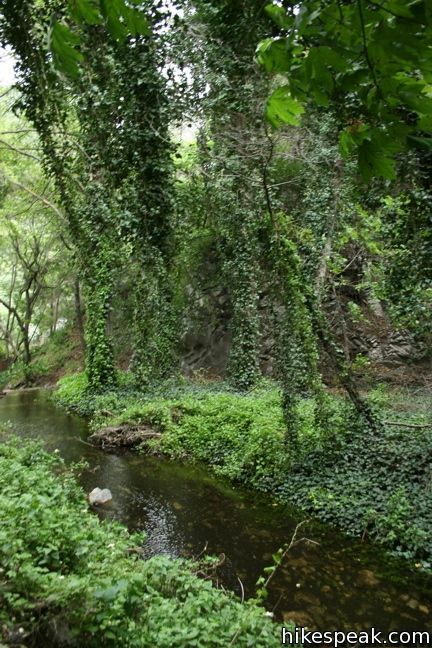 This 3.25-mile hike visits a 60-foot waterfall and a lush cottage-lined canyon. 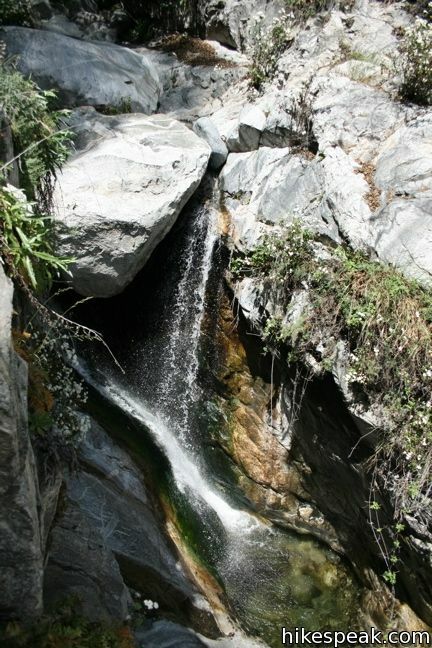 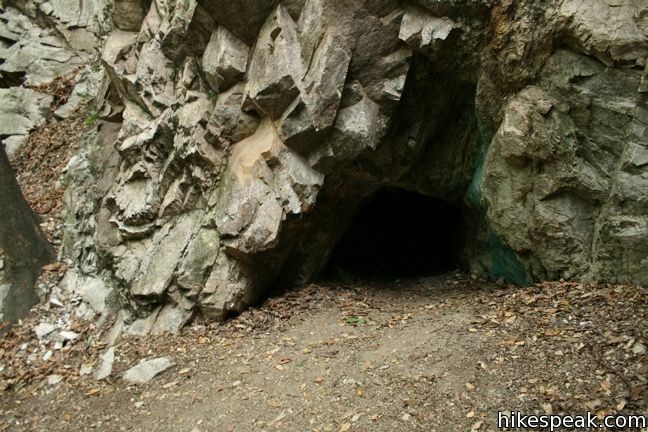 This 6-mile hike from Millard Campground leads past Millard Falls to an old gold mine. 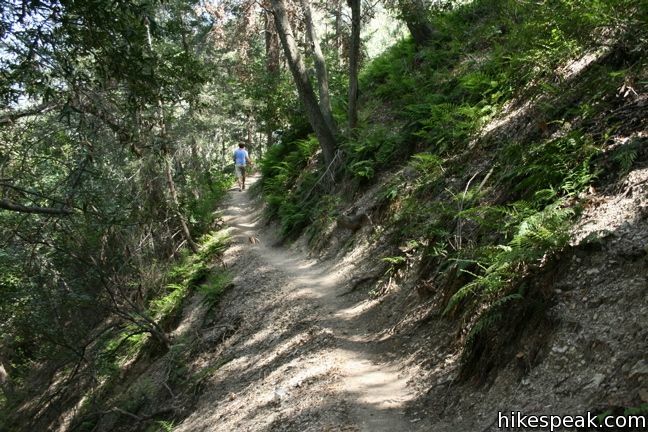 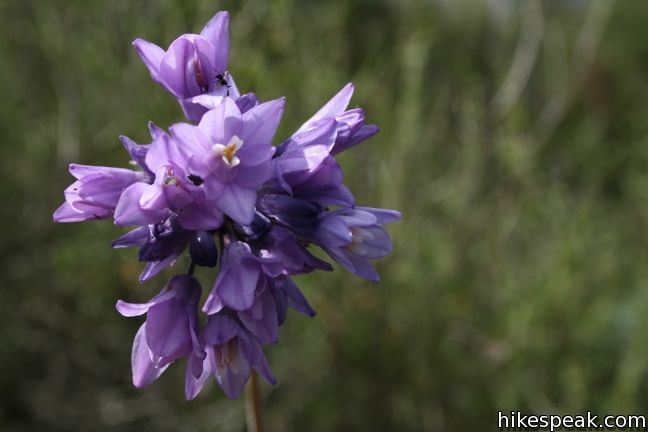 The 5.5 to 6 miler can be completed as an out and back hike or a loop, traveling through a pine forest to a round summit. 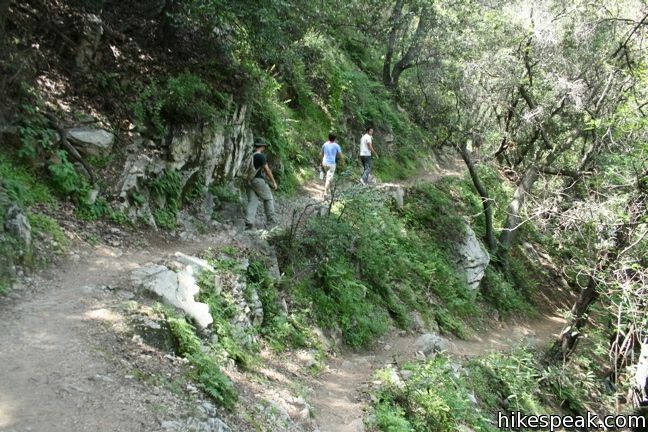 Add six miles to the hike by dropping across a saddle and climbing to the summit of Twin Peaks.